It wasn't the win they desperately wanted but the Melbourne Rebels delivered an improved performance in their 34-16 Super Rugby loss to the Cheetahs in Bloemfontein. The Rebels were looking to rebound from their franchise-record 64-7 loss to the Sharks in Durban and the subsequent suspensions of Wallabies Kurtley Beale and Cooper Vuna for fighting in the hours after the game. The pair was sent home from South Africa, leaving their shattered team-mates to regroup for another tough challenge against the in-form Cheetahs at altitude. The Rebels were in the game until the 65th minute but three tries in the space of eight minutes - two while lock Luke Jones was off the field with a yellow card - blew the scoreline right out. Jones was sin-binned for a late shot on Willie Le Roux after the Cheetahs winger had put a kick through. Melbourne showed some character early and were unlucky not to lead at half-time. Cheetahs centre Johann Sadie drew the defence and then got a pass away to fullback Hennie Daniller, who touched down in the 36th minute. Five-eighth Burton Francis converted for a 10-6 lead, with the Rebels points coming through successful penalty kicks by James O'Connor. While their defence improved on a woeful effort against the Sharks, the Rebels were still let down by some silly errors when they were in good attacking positions as they tried to push a final pass. 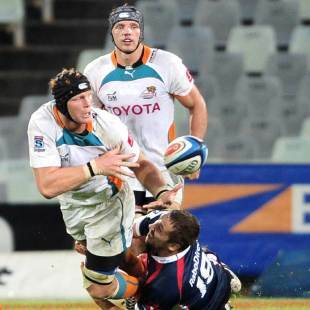 The Cheetahs showed their willingness to send the ball wide and reaped the rewards. Springboks centre Robert Ebersohn showed his pace to set up the first try of the second half as he beat three defenders and then got a backhand pass away to winger Raymond Rhule. Another penalty by O'Connor kept the Rebels to 17-9 until the Cheetahs' flurry of tries, scored by le Roux, Sadie and Ryno Benjamin. The Rebels late try was scored by replacement lock Cadeyrn Neville. "It was a big improvement on last week and for 60 minutes or so we were right in it," Melbourne skipper Gareth Delve said. To leak a couple of tries late was disappointing. I can't fault the effort from the lads, it was a big step up from last week." The Rebels next travel to Perth to face the Western Force.